All suites feature the same amenities as follows: Keurig coffeemaker, complimentary Wifi, HD TV with HBO and STARZ channels, iron and board, two waffle weave bathrobes, private balcony or patio, hair dryer, safe, wet bar and mini-bar stocked with local, organic and gourmet items. All suites have a king size bed and separate living room. Maximum occupancy for suites is 2 adults (a crib may be added for a baby). Suites range in size from 750 – 1,000 square feet. 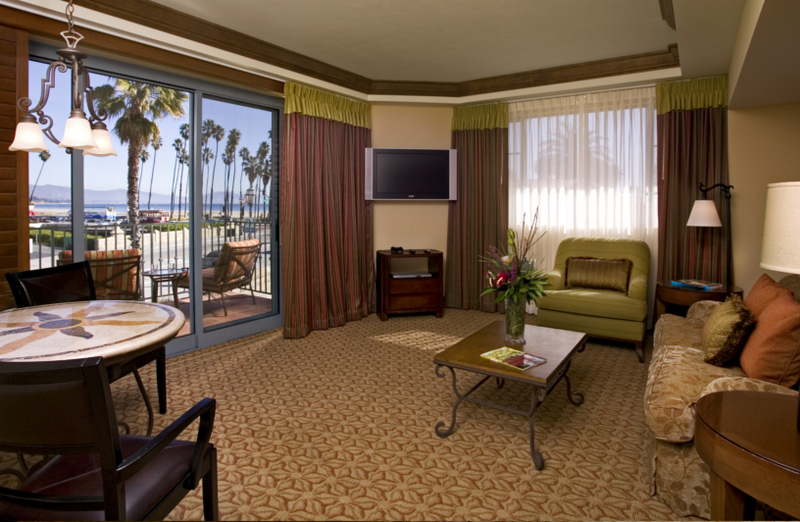 Located on the third floor of the South Wing - overlooking the oceanfront. This suite is approximately 1,000 square feet and has a wet bar in the living room and a sunken tub in the extra-large bathroom. Located on the second or third floor of the South Wing – overlooking the oceanfront. These suites are approximately 850 square feet and have a wet bar in the living room and a sunken tub in the extra-large bathroom. Located on the first, second or third floors of the South Wing – overlooking the city or the resort. These suites are approximately 750 – 850 square feet and feature a wet bar in the living room and a sunken tub in the bathroom. *Please note that photographs are a representation of our suites. They are not guaranteed to be identically equipped or furnished as shown.